Memory standards group JEDEC has published the final specifications for DDR4 SDRAM, promising more performance, reliability and efficiency than today's DDR3 parts. DDR4 touts a per-pin data rate of 1.6GT/s to 3.2GT/s (giga transfers per second), though JEDEC notes that the ceiling may eventually be raised with an updated spec, just as DDR3 has managed to exceed its original targeted performance of 1.6GT/s. The new design runs at 1.2 volts versus 1.5 volts for DDR3, and its bus speed will start at 2133MHz versus 1333MHz and 1666MHz for DDR3. Additionally, JEDEC says the architecture has an 8n prefetch with two or four selectable bank groups, which allows DDR4 devices to have separate activation, read, write or refresh operations underway in each bank group -- a design that improves efficiency and bandwidth. Naturally, there are no hard dates on when you'll be able to purchase DDR4 modules for your system, but most estimates suggest it'll be a few years. Last June, iSuppli wrote that DDR3 RAM would represent over 90% of the DRAM market through 2013 and that would drop to 85% in 2014 with DDR4 occupying 12% of the market. The outfit reported that by 2015, DDR4 would have a 56% share, pushing DDR3 to 42%. 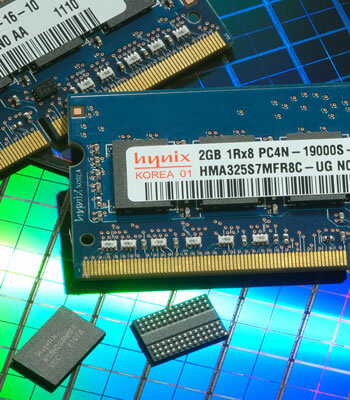 Manufacturers, however, would like to accelerate the adoption of DDR4 to boost prices and sales according to a Forward Insights researcher speaking with Computerworld, and they have been showing DDR4 modules at trade shows this year. In May, Micron announced the development of its first fully functional DDR4 module along with revealing plans to begin mass production in the fourth quarter of this year. Regardless of whether DDR4 modules are available, enthusiasts will have to wait for platform support from Intel and AMD. In April, it was reported that Intel expected to begin supporting DDR4 in high-end four-socket Haswell-EX servers by early 2014. Meanwhile, its consumer platforms may not support the spec until 2015, as 2013's 22nm Haswell and 2014's 14nm Broadwell architectures will both use DDR3.